PRO-SYS toothbrush is named a 2015 Silver Edison Award™ Winner for Excellence in new product development. bb7, a comprehensive product development firm, announced today that the PRO-SYS toothbrush was the recipient of a 2015 Silver Edison Award™. The PRO-SYS toothbrush, sold by Benco Dental, was designed and developed in collaboration with bb7. The Edison Awards™ are conducted by Edison Universe, a non-profit, 501(c)(3) organization dedicated to fostering future innovators. The Awards have recognized and honored the best in innovations and innovators since 1987. They honor game-changing innovations at the forefront of new product and service development, marketing and human-centered design. The prestigious awards are one of the highest accolades a company can receive in the name of successful innovation. The PRO-SYS toothbrush was one of three winners in the Dental Patient Care category. The PRO-SYS toothbrush is the latest on bb7’s extensive list of new product development solutions for the dental industry. Past projects have included the first set of wireless dental loupes, a revolutionary dental curing wand and robotic testing equipment to evaluate toothbrush performance. Many of these products have garnered awards and recognition from Dentistry Today and The Medical Design Excellence Awards. “Working with Benco Dental on their line of professional and consumer toothbrushes was a perfect fit for our capabilities and experience. Our design team sculpted quick form studies of sketched concepts, so decisions were reinforced with hands-on experience,” said John Miller, Director of Industrial Design and User Research at bb7. PRO-SYS oral health care products unite design simplicity with clinical efficacy. The PRO-SYS Tapered Toothbrush includes (from the inventor of the nylon bristle) DuPont® Tynex filaments arranged in a multi-level design for improved cleaning. The design is intended to clean deeper in difficult-to-reach areas without sacrificing comfort; tapered bristles clean under the gum line. The contoured handle of the PRO-SYS toothbrush – three years in the making – was shown to substantially reduce debris accumulation and bacterial contamination after prolonged use. In recent clinical findings by The Dental Advisor’s John A. Molinari, Ph.D. and Peri Nelson, B.S., the rubber-free handle on the adult and junior series toothbrushes in the PRO-SYS® oral care family remained 1,500 times cleaner than other brush handles after months of use. Contact us to learn more about bb7’s product development capabilities and experience in the Medical, Dental, Consumer and Commercial industries. Schedule a visit and see how bb7’s world-class researchers, designers, engineers, and scientists unite to solve the most complex challenges. Our teams worked on subatomic particle testing equipment in Antarctica, integrated Nobel Prize-winning technology into a portable medical device, made a thermostat interface intuitive for everyone (even Grandma), resurrected an iconic machine that hadn’t been re-designed since the Kennedy administration, and so much more. What solution can we masterfully develop for you? In 2011, the makers of the PRO-SYS toothbrush searched for a better brush to offer their core customers—dental professionals—so they, in turn, could send patients home with one. The PRO-SYS team visited manufacturers as far away as China, Israel and India. Long story short: they didn’t find it. The PRO-SYS team decided to create a new, better toothbrush which marked the beginning of a three-year journey. The toothbrush was developed with two non-negotiable goals: excellence in clinical efficacy, and beautiful simplicity in design. A clean handle is a healthy handle; PRO-SYS has done away with colorful rubber accents that can trap gunk. Instead, it is a gently chiseled shape that falls effortlessly in the hand. The simplified handle helps improve tactile feedback. The toothbrush also features DuPont® bristles (from the inventors of the Nylon bristle) that are born from years of research and experience. 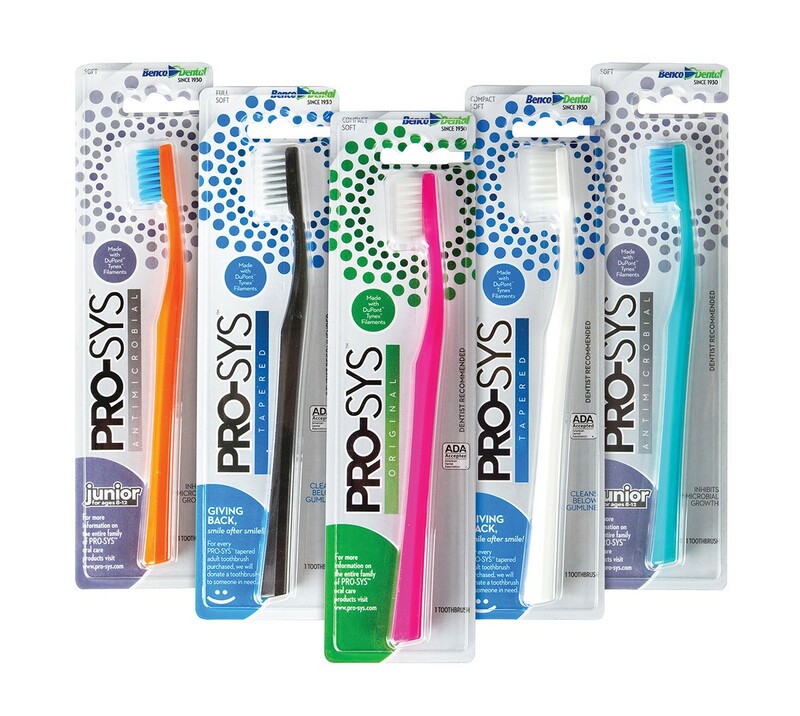 PRO-SYS has quickly grown from toothbrushes to a complete oral care brand. PRO-SYS strives to bring customers exceptional products by applying a unique emphasis on function, simplicity and quality. It’s the PRO-SYS Approach. Put simply, if PRO-SYS can’t make something better, they won’t make it at all. Better design. Better usability. Better value. Better results. For more information, visit pro-sys.com or call 570.602.7781.